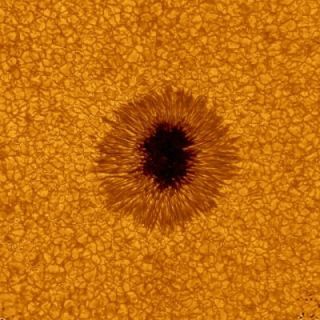 A new photo of a sunspot on the surface of the sun taken bya telescope in California is the most detailed seen in visible light,scientists say. Sunspots are temporary dark structures on the surface of thesun caused by intense magnetic activity. They sometimes erupt, sendingenergetic storms into space that can head our way. By studying sunspots,scientists hope to better understand solar weather and its effects on Earth. Astrong solar storm can send powerful charged particles streaming at our planetthat can knockout power grids and destroy electronics, both in satellites and on theground. The telescope is touted to be the worlds? largestground-based solar instrument and was completed last year, NJIT officials saidin a statement. The new sunspot photo is the "first light" targetfor the observatory's new advanced optics system during a solar photography sessionon July 1-2. It has a resolution of about 50 miles (80 km) and is the best yettaken by a ground-based telescope, observatory officials said. Adaptiveoptics in telescopes is a technique that uses a deformable mirror tocompensate for the blurring of images caused when light passes through Earth'satmosphere. The New Solar Telescope has 67 motors that can be moved to bend themirror to provide clear pictures of the sun. The observatory is a pathfinder for a proposed larger solartelescope, the Advanced Technology Solar Telescope, which would have 349 motors,observatory officials said.